Pro-cannabis campaigners will hold a rally in Trafalgar Square after an annual festival was banned from taking place in south London. Lambeth Council would not permit the seventh Cannabis March and Festival in Brockwell Park, Brixton, because of drug dealers at previous events. 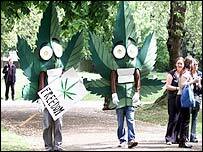 But the Greater London Authority (GLA) has allowed the Cannabis Education March and Rally to go ahead on Sunday. It begins in Russell Square, central London, at 1300 BST. Speakers will lead the rally in Trafalgar Square from 1500 BST until 1900 BST. The subject of returning cannabis to a Class B drug after it was downgraded to Class C will be discussed as will health concerns, drug testing and driving under the influence. Organisers of the Brixton festival said they were aware of drug dealers being present but had wanted to work with Lambeth Council and the police to stamp out the problem. Campaigners say they want the drug regulated and say legalisation would not lead to increased use. Scotland Yard has agreed the route for Sunday's march.